Image credit: De la Salle Philippines. The year was 1904, two years after the end of the Philippine-American War. The Americans, having finally overcome armed resistance from the Filipinos, were quick to consolidate their foothold in these islands. Apart from laying down the foundation for a colonial government based on their own system, the Americans were also eager to enculturate the Filipinos into their own way of life. Because of this, many American soldiers who fought against what they considered as Filipino insurgents became teachers after being discharged from service once fighting began to subside after the capture of General Emilio Aguinaldo in Isabela in 1901. These teachers were arriving to bolster the country’s public school system similar to the Americans’ secular or non-religious way. At the same time, there was an influx of Protestant missionaries into the country, encouraged as they were by McKinley’s call to “civilize and Christianize the country.” The American President’s statement, of course, was likely made in ignorance because the Philippines had become predominantly Catholic – and, therefore, Christian – under Spanish rule. Because Spanish clerics had been hastily making an exit from the country since the turnover to the Americans, these early years of American colonization were, as observed by the Jesuit Historian Fr. Horatio de la Costa, difficult and dangerous for the Catholic Church in the Philippines. As fate would have it, a De la Salle Christian Brother by the name of Brother Abdon Edward would be visiting the Philippines in 1904. Brother Edward was a prominent educator who was formerly Vice-President of the Christian Brothers’ School called Manhattan College in New York City and also headed many other schools owned by the Brothers in the United States. His visit to the Philippines, however, was primarily for medical reasons. While on sick leave in California, he was advised by his physician to go on a sea voyage which, hopefully, would cure his lung ailment. He arrived in Manila on the 29th of December 1904 and stayed for no more than a couple of weeks. Crucially, he had a meeting with Msgr. Jeremiah J. Harty, the newly-appointed American Archbishop of Manila and coincidentally an alumnus of a Christian Brothers school in St. Louis. During this meeting, the archbishop was supposed to have expressed to him concerns that Catholic education was losing ground to the increasingly popular secular system of education that the Americans had begun to institutionalize. Upon his arrival back in the United States, Brother Edward duly reported his meeting with the archbishop to his superiors. The Philippines, however, were outside of the Christian Brothers’ area of jurisdiction; so initially, nothing became of the matter. The meeting with the archbishop must have left a real impression on Brother Edward, however, because later in 1905, he wrote to Brother Gabriel Marie, Superior General of the Christian Brothers, to formally ask that a De la Salle school be opened in the Philippines, preferably in the Archdiocese of Manila. Meanwhile, Msgr. Harty himself had been working on the same thing. He also wrote a letter inviting the Brothers to set up a school in Manila. The Brothers were initially lukewarm. The Brother Visitor for the Far East, a Brother Gabriel Archange, had been to Manila in 1904 to study the feasibility of setting up the school. He had cautioned against doing so because, as he saw, the Archdiocese of Manila did not have the funds to support such a school. 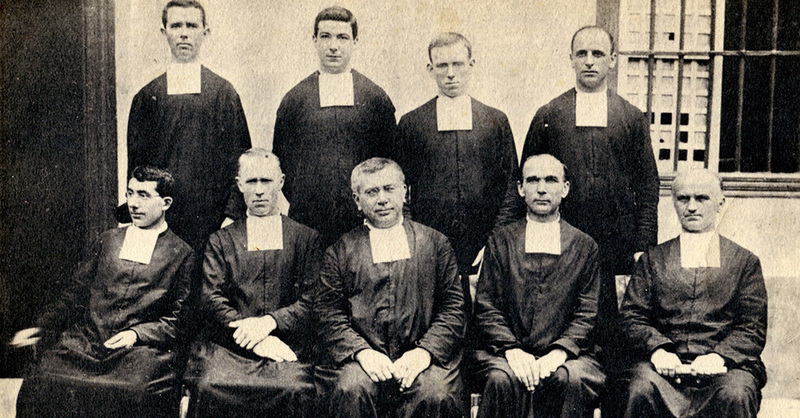 In 1907, however, the Brothers agreed to send a committee to Manila to discuss the matter with Msgr. Harty. The monsignor, however, was in the United States when the committee arrived. Instead, they set up a meeting with the incumbent Governor General Luke Wright, who made it plain to the visiting Brothers that the colonial government did not have funds for the setting up and subsidy of private schools. While the Brothers would have preferred subsidy to open schools in new territories, there were also cases when they actually did but on the condition that the students would pay fees to make the endeavor viable. This was apparently going to be the case in Manila; and the fact that Msgr. Harty was an alumnus must have weighed heavily on his wish being granted despite the obvious obstacles. At the General Chapter meeting of the Brothers the mother house in Belgium later in 1907, it was finally agreed to open a school in Manila. Whatever reluctance the Brothers might have harbored against opening a paying school – which would have made it available to the children of the rich and, therefore, contrary to the De la Salle movement’s mission of serving the poor – must have been set aside when Msgr. Harty obtained an endorsement from no less than Pope Pius X in 1911. 1 There were actually two bodies referred to as such, the first set up in 1899 and the second in 1902. “Philippine Commission” online at Wikipedia. 2 As with most details of this article, taken from “La Salle: 1911-1986” by Carlos Quirino, published 1986 by the Filipinas Foundation for De La Salle University. 3 “Thomasites,” online at Wikipedia. 4 “De La Salle University,” online at Wikipedia.